There is no doubt that one of the most interesting hearings in the European Parliament on Juncker's new Commission will be of Hungary's candidate Tibor Navracsics out of spite of his portfolio. The reason is that he comes from Hungary, directly from Viktor Orban's government who is now leading an open war against the European system of values and the liberal democracy. The situation of democracy in Hungary will certainly be a major topic during Mr Navracsics's hearing on 1 October at 1800 (CET) in front of two parliamentary committees - of culture and education and of industry, research and energy. The Hungarian candidate's portfolio is "Education, Culture, Youth and Citizenship". As euinside wrote, the candidacy of a member of Orban's government is problematic for all political groups but to a various extent, as it became clear from the refusal of the main political groups to agree to put on the agenda of the September plenary session a debate on the situation in Hungary. According to EPP and the group of Socialists and Democrats, there are no new developments that are worth holding another debate on Hungary. The situation in the country, however, shows something different. On 2 June this year, agents of the Hungarian government stormed the offices of three non-governmental organisations that participate in the distribution of the Norwegian grants. Those are based on an agreement between the EU and Norway, Iceland and Lichtenstein for funding projects in the less developed European economies. In the past years, with money from the so called Norwegian Grants have been financed organisations that are critical to the Hungarian government. On 26 July, Viktor Orban made a speech in which he announced that he will be building a new, illiberal regime and that NGOs funded with foreign money are in fact foreign agents who aim to destroy the political status quo in the country. Earlier this year, Russia's President Vladimir Putin, too, accused the NGOs of being foreign agents. He also believes that the West is funding, through non-governmental organisations, radical groups in Ukraine, who are responsible for the removal of President Viktor Yanukovych. According to Putin, the NGOs, "serve foreign national interests", which was literally quoted by Viktor Orban in his speech before a Hungarian minority in Romania in end-July. And on 8 September, special police forces stormed the offices of several organisations in Budapest and confiscated boxes with documents and laptops. But to the European Parliament this was not new. According to Brussels insiders, the reason is that there is an agreement between the two big political families (EPP and S&D) for fast and easy approval of the new Commission. If the complicated multilayer balance - among states, parties, men and women, expertise - is destroyed there will be a new and very big institutional crisis. There is talk that there could be sacrifices - either from ALDE or the Greens - from groups that did not take part in the political poker this summer. However, the situation with the Hungarian candidate is much more serious than the political poker because fundamental European values are at stake as they are set in the EU's founding treaties signed by all member states. In particular, Article 2 of the Treaty of the EU which defines the rule of law, democracy and fundamental rights fundamental European values. Against the backdrop of the many crises boiling over around the EU, related mainly to a strong return of dictatorship, it really seems ridiculous European diplomacy to preach values that are not been respected in the Union itself. This was a major thesis during the hearing, organised by the Liberals after they failed to put a debate on Hungary on the agenda in September. They vowed that they will insist until the topic is included. 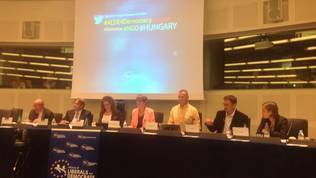 For the hearing they invited representatives of Hungarian NGOs and watchdogs to present the facts and then members of ALDE group and other political groups asked specific questions. According to ALDE group leader Guy Verhofstadt, who was one of the runners for European Commission chief during the campaign for the European elections this spring, Hungary is not the only member state where the respect for the rule of law and the fundamental rights is not satisfactory. The proposed in the spring common European mechanism to defend the rule of law is only on paper and has never been applied, he said. It's a shame that the Commission and Parliament are silent, he added. 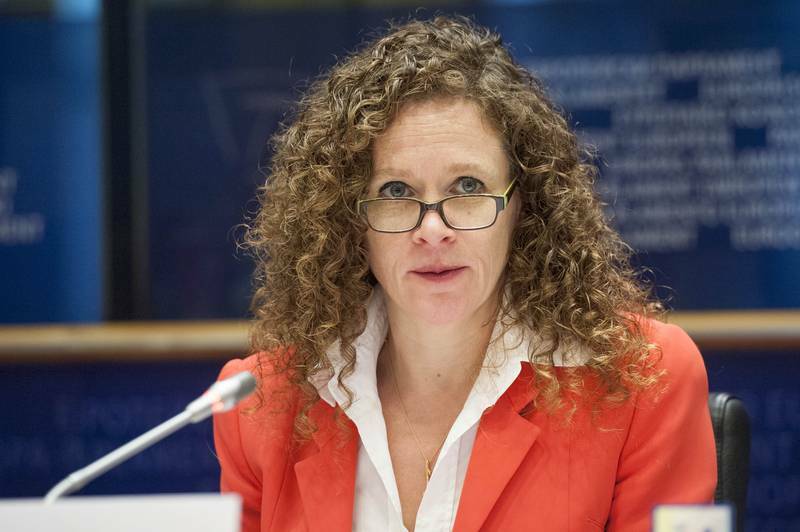 Dutch MEP Sophie in 't Veld, very active in the European Parliament on the Hungarian dossier and also on fundamental rights and freedoms, said she was disappointed that EPP and the Socialists did not support a debate in the plenary. "This is not a debate about a particular country but about our fundamental values. This is a test of the EU as a community of values", she said. 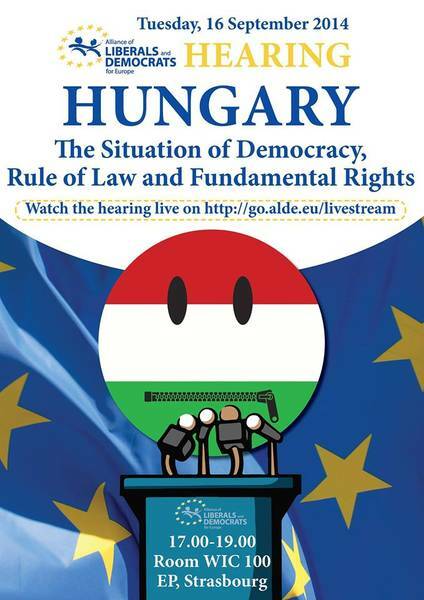 Hungary represents a threat to the fundamental rights and liberties - the freedom of media, of expression of religion, of education, equal treatment, independence of the judiciary, the central bank, etc, she continued. Stefania Kapronszay, Executive Director Társaság a Szabadságjogokért - Hungarian Civil Liberties Union - said during the hearing on 16 September that during the first term the Orban's government began attacks on critical journalists and media. Now, his goal is to discredit independent NGOs who are the only opposition to the government at the moment. "It is impossible not to be reminded of the rhetorics on watchdogs in Russia about the foreign agents", she said and added: "I believe that these attacks are also attacks against the core EU values. Therefore, the EU should act on them". There is a bigger picture, according to Attila Mong, journalist and member of the investigative journalism NGO Atlatszo.hu. To win the media war is important in the context of Orban's new regime. "Look at Russia. It is really a good example", he added. Today's Hungarian public media are practically a mouthpiece of the government. There is a bunch of independent media that have survived but they are subjected to systemic tax pressure. Lydia Gall, responsible for the Balkans and Eastern Europe at the Human Rights Watch, pointed out that the Commission mainly focuses on trifles which facilitates the Hungarian government to do only cosmetic changes to controversial legislation. The main problems remain unaddressed as is the case with judges being forced to retire earlier. Since July last year, when the European Parliament issued a very sharp report on Hungary, no further actions followed, she added. According to her, Viktor Orban's July speech and the recent pressure on civil society and media in Hungary are met with silence, especially by the EU, which is unfortunate. Asked by many of the present MEPs, the representatives of Hungarian NGOs recommended Tibor Navracsics to be seriously interrogated on many of these issues during his hearing. Although there is a significant difference between him and Orban, the fact that he will be responsible for citizenship is crucial in Europe, said Andras Nun, Director of Autonomia Foundation (Member of the foundations consortium managing the implementation of the Norway Grants). Ask him what does he think of active citizenship, he added. Stefania Kapronszay recalls, however, that Navracsics was a minister of justice between 2010 and 2014 in Viktor Orban's first government. It was under him that the laws curbing the powers of media, the judiciary and the central bank were adopted. This is something that needs to be raised during the hearing. "I would like to ask the EU to use this tool - Article 7 because this would be a turning point. Please, use it wisely but bravely", she said meaning the "nuclear button" of the EU with which Austria was threatened with many years ago. 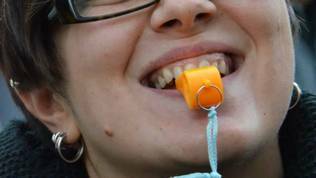 It means suspending the voting rights of a member state in the Council. Attila Mong said, for his part, that giving pieces of advice to MEPs what to ask the Hungarian candidate would equal a treason and that would qualify him as a foreign agent. And although during the hearing it was said many times that Hungary is not the only country that is regressing in the EU, no specific names were mentioned. 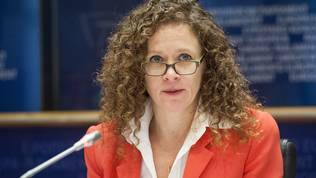 Sophie in 't Veld concluded emotionally the discussion saying that EU was about the matter. It is not about the curve of cucumbers or the ingredients of the marmalade or the power of vacuum-cleaners. It is about values. This is what sets us apart from other parts of the world and is something worth fighting for. Another country with very similar problems is Bulgaria, which, on top of it, has a special mechanism the purpose of which was to ensure that the country will complete the reforms of the judiciary and the fight against corruption and organised crime after its accession in 2007. This mechanism, as a matter of fact, served as a foundation for the rule of law mechanism. Although in Bulgaria, the situation is not that evident as in Hungary, still it is serious. Antoaneta Tsoneva, director of the non-governmental organisation Institute for Development of the Public Environment, which has been fighting for years for more transparency of the countless amendments of the electoral code and which was at the epicentre of the protests in Bulgaria last year, told euinside that it was during the anti-government protests that a propaganda inflamed fuelled by the institutions and pro-government media that NGOs, funded from abroad, were behind the protests. Then the term "Sorosoids" appeared after the organisations funded by George Soros. Ms Tsoneva admits that there definitely is a campaign against NGOs funded under international programmes. According to her, those are the working organisations with active and clear positions. "Inconvenient and critical to the power and oligarchy. In Bulgaria, there are no sources for funding NGOs". The propaganda war started from day one of the protest, Antoaneta Tsoneva added. According to her, the situation is not as tough as in Hungary. Offices are not being attacked, there are no official positions of the institutions that the activities of one or another organisation need to be suspended or a programme to be suspended, as happened with the Norwegian fund in Hungary. But there is a problem and it is: "We're independent and that worries strongly the defenders of the status quo", she concluded. 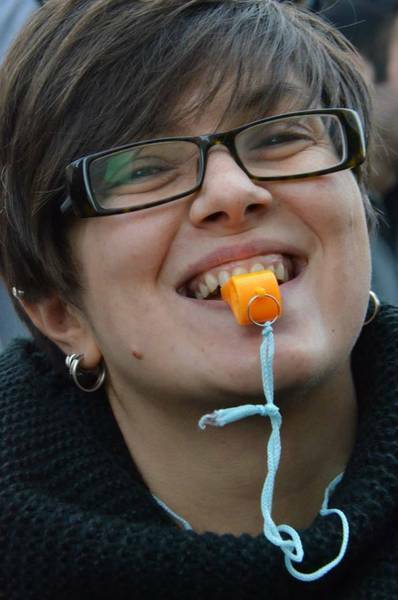 Magdalina Guenova, an activist and blogger who recently created a Facebook page "A Daily Doze of Hate", says that "there are no repressions in the classical meaning of the term, but the methods for pressure and blockade are many - the denial of the state to fund organisations (the money is each year allocated to circles of NGOs that are close to the government or sport clubs), using of pro-government media to delegitimise causes and problems, etc. In the same time, there is a direct pressure over individuals who send signals to the prosecution for violations of article 162 of the Penal Code - they are being called in the police for interrogation. This happened to me as well". Currently, there are unsanctioned hate crimes, inactive institutions, complete inadequacy and lack of interest with the ruling and other political parties. There is a growing aggression against LGBT people from various directions, mostly by people who sympathise with Putin's regime. According to Magdalina Guenova, the problems started to return (there was a brief pause after the fall of communism) after Bulgaria joined the EU in 2007. "The reasons are complex, but it seems that on the one hand it is the disappearance of the need to fulfil criteria, to be evaluated and, on the other hand, the social-political processes that led to the oligarchic ruling model of the last three governments". Most media, she believes, are an active accomplice in these processes because of the lack of professionalism and sanctions but also because of their role of being part of the oligarchic model in modelling the social attitudes and electoral moods. Magdalina Guenova created her Facebook page (already several times attacked and banned) with the idea to serve as "a virtual exhibition of what the subjects of hate are daily challenged with - refugees, Roma, LGBT people, Jews and people who most often simply want us to live in a better society. The purpose [of the page] - through a shocking effect to accumulate greater public support for the fight against these hate crimes". Czech MEP (ALDE) Pavel Telicka said during the hearing that the situation in Hungary reminds him of "what we witnessed in our former lives in the Czech Republic under the communist regime. I'm afraid this is the same behaviour, the same language, the same vocabulary. I'm appalled. It was young students from Fidesz that came to Prague before the fall of communism to demonstrate for freedom, for human rights. So I'm afraid that this shows that power corrupts". His Slovene colleague Ivo Vajgl (ALDE) pointed out that this problem exists in Slovenia, too. Politics is trying to possess media through oligarchs, he said. 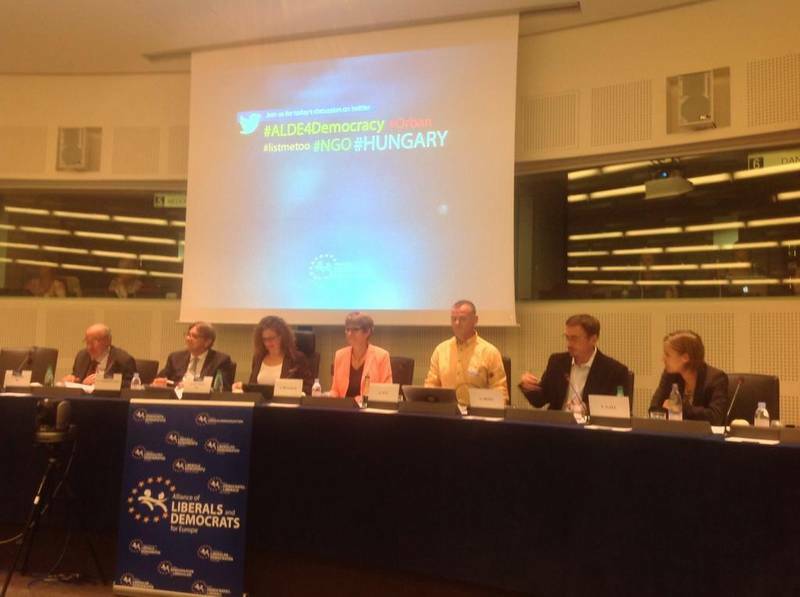 None of the four Bulgarian ALDE members spoke during the hearing on Hungary. They are part of the Bulgarian party Movement for Rights and Freedoms which is the main participant in the destruction of the fragile and young liberal democracy in Bulgaria. That is why, it would be good ALDE to turn against their own as well when it asks the same of the EPP and the S&D. According to The Economist, Egypt and Hungary are just two fronts of the escalating war led by authoritarian governments against groups that promote the Western vision of liberal democracy not only in the sense of regular elections, but also of public, pluralistic debates. Azerbaijan, Mexico, Pakistan, Russia, Sudan and Venezuela have all adopted legislation in the past two years that directly affects NGOs that receive foreign funding. There is another dozen of countries that are planning to do the same, including Bangladesh, Egypt, Malaysia and Nigeria, the newspaper wrote in the beginning of September. That is why, it will be crucial how will the EU handle these problems in its own yard. As many of the participants in ALDE's hearing said, there is no way to promote rights in Syria, for instance, if it is allowed, for the sake of political balance, these rights to be violated in Europe. It is a good news that Jean-Claude Juncker's right hand receives precisely such a portfolio - the rule of law and fundamental rights. 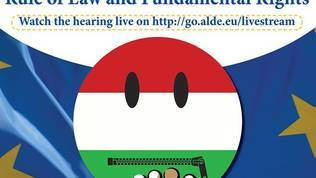 Certainly, the Hungarian issue will be raised during Frans Timmermans's hearing as well on October 7 at 1430 (CET). His appointment, however, cannot and should not serve as a sweetener to easily swallow the Hungarian candidate who was an active accomplice in the violation of Article 2 of the Treaty in Hungary. Besides, as a justice minister he had a leading role in passing the laws that limited the independence of media and justice and as a foreign minister he protested this year to the Norwegian government against the grants. If the EU were to use the nuclear option against Hungary, that would be a signal for all the others both in the EU and outside. The respect for own rules is much more important than who will be the chief of the European diplomacy, who will take what portfolio in the Commission or whether the party or gender balance is good. Much more important. There is nothing the EU should do about Hungary. Orban&apos;s government was democratically elected and Brussels has to respect the will of the people- after all, that&apos;s what democracy is all about. What you are proposing is the exact opposite, it&apos;s some form of Liberal tyranny. In that case, Hungary should make plans to get out of the EU, as when you do not respect the rules, what are you even doing here? Maybe the economic backlash of that will compel Hungarian voters to no longer vote for lunatics like Orban. Leaving out disaster relief, the issue of foreign funding of NGOs active internationally in politics, civil society and even humanitarian aid should be properly and openly debated. It is legitimate to ask what their aims are, what are their bakers&apos; motives and what are they trying to achieve. Without open discussion they are simply a covert form of imperialism. The grassroots resentment in the countries being targeted becomes unavoidable because it feels like foreign money rules. There is a point to the principle that NGOs should be funded locally to be truthful expression a country&apos;s civic society. Without an open and transparent debate, domestic and foreign "oligarchs" fight each other over the heads of citizens for market share for their ideas followed by economic dominance.